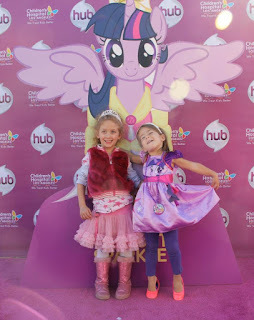 We are late (as usual these days) in posting about our super fun day at the Strawberry Shortcake concert and super delicious, pink-infused per concert VIP party and the concert after! 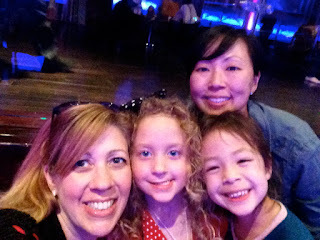 When we arrived at the Nokia Theater's upstairs lounge, the room was up-lit in pink, and we were treated to mini strawberry shortcake desserts, naturally, and pink chocolate chip cookies and lemonade. We had some time to sit on the very cushy and intimate round sofas with our friends before being whisked into the theater. 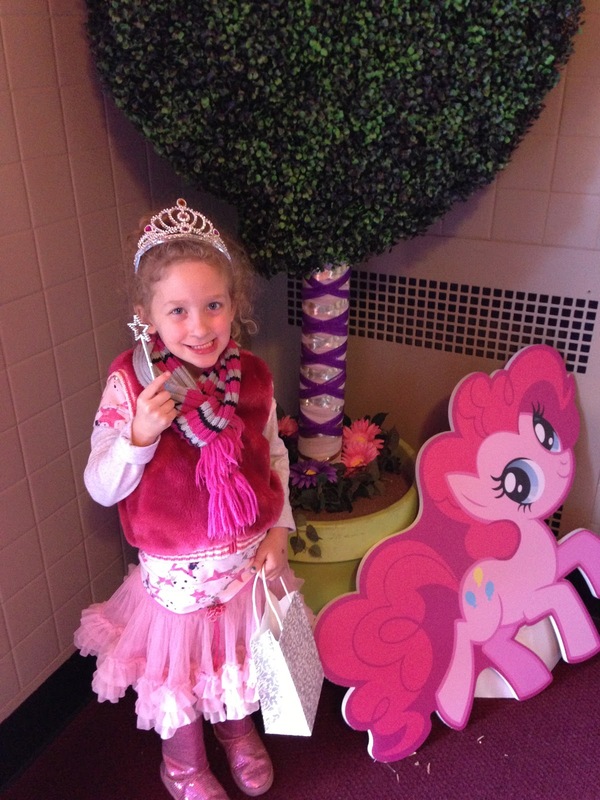 Being Strawberry Shortcake's first live show, we were excited to see what would happen! 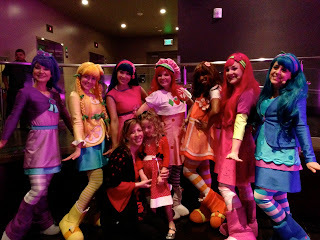 We enjoyed the Doodlebops' opening act and hanging with our friends! A big THANKS to Hollywood Hot Moms for the invitation! 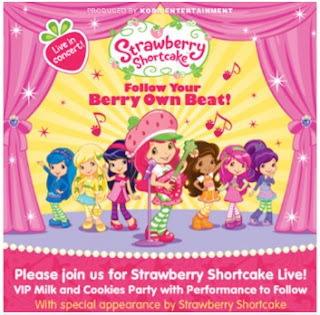 New York – November 27, 2012 – Everyone's berry best friend Strawberry Shortcake makes her North American theatrical debut next year in Koba Entertainment’s all-new musical production, Strawberry Shortcake: Follow Your Berry Own Beat . The live show was written, choreographed and directed by Koba’s Artistic Director, and theater veteran, Patti Caplette. Randy Bachman (The Guess Who and Bachman-Turner Overdrive) along with his daughter Lorelei Bachman co-wrote two brand new songs for Strawberry Shortcake: Follow Your Berry Own Beat that are guaranteed to have families dancing in the aisles. Strawberry Shortcake, a favorite of little girls and moms alike for over 30 years, will be played onstage by Toronto native Amelia Sirianni. “We are excited to bring Strawberry Shortcake to life in an exciting new stage production that showcases her berry bubbly personality and musical talent while inspiring young girls to do big things,” said Lindsay Martinez, director of licensing and business development for American Greetings Properties, the intellectual property and outbound licensing division of American Greetings Corporation (NYSE: AM), the global rights holder for the Strawberry Shortcake brand. 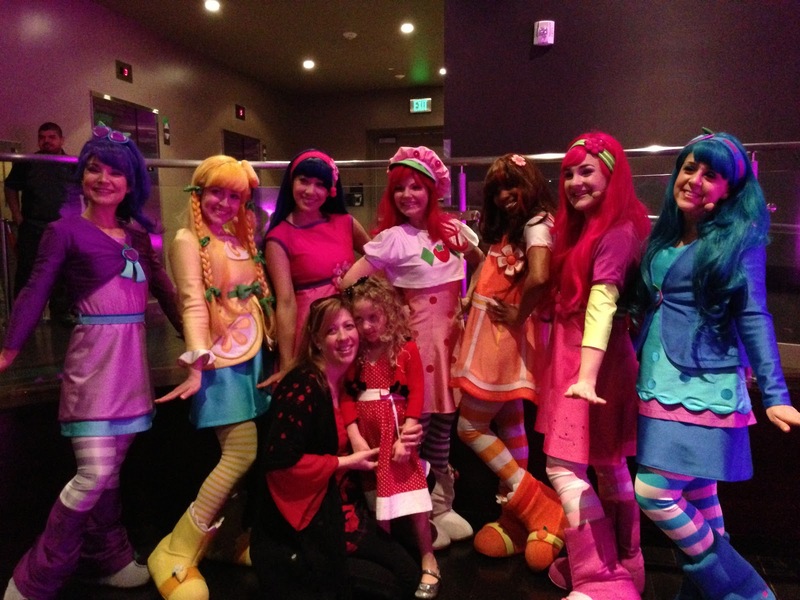 Before the girls of Berry Bitty City hit the stage, theatergoers will warm up their singing voices and stretch their dancing muscles with the touring cast of the Doodlebops. Responding to calls from their legions of clamoring fans, Rooney, Moe and Dee Dee Doodle take to the stage in a live concert performance that will get the whole audience movin’ and groovin’. I must admit I have never really watched My Little Pony. My daughter isn't particularly into it either, BUT, she IS very much into horses. So when we had the opportunity to attend The Hub TV Network “My Little Pony Friendship is Magic” Coronation Concert for Twilight Sparkle, the newest My Little Pony, we decide to go. 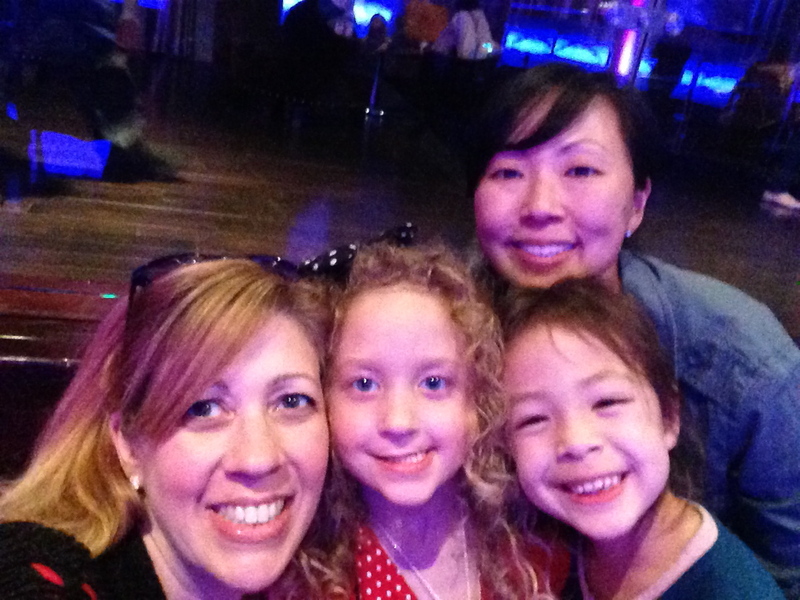 Joining us were two friends and their daughters, so it was a girls day. It was great fun! And thanks to OC Mom Blog for the tickets! 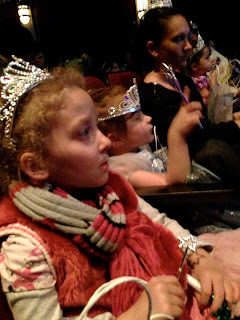 We discovered the characters: Pinkie Pie, Rainbow Dash, Fluttershy, Applejack and Rarity, and at intervals during the screening, we were instructed to blow bubbles, wave our wands and toss confetti. After the show we met Miss America, Mallory Hagan. 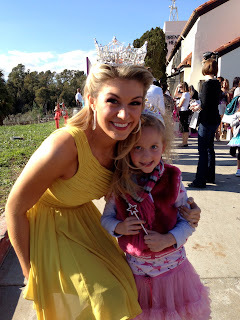 She was very warm and hugged all the little girls and never lost her smile. I had expected to watch a cartoon and ended up having a really good time with my and my daughter's friends! 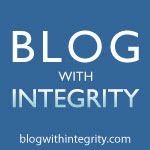 Unfortunately our cable company does not offer HubTV, so we'll miss the official debut on TV. But our sneak peek and girls day was well worth it!